Pine trees are prolific around southern California and provide not only year-round foliage, but interesting cones and plenty of shade in this sometimes warm climate. In general, pine trees thrive in full sun with regular water, but are nearly drought-resistant. Many of the varieties that are found in southern California enjoy the cool, foggy mornings. 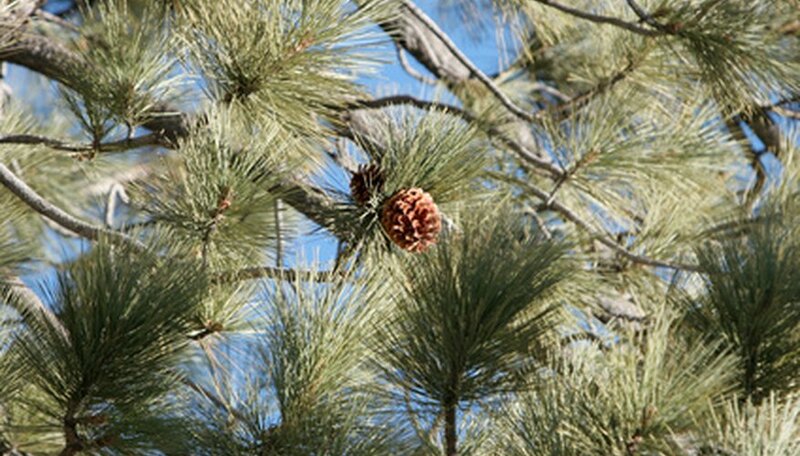 Pine trees have needles that come in bundles of two to five and produce cones that may be spiky or flat and vary in shape from long and narrow to egg shaped. Bishop pine (Pinus muricata) is unique to the California coast and it grows along the coast to about 12 miles inland. This tree prefers mild, foggy areas. Needles on the Bishop pine are in packs of 2 and are about 6 inches long. The tree produces small cones with prickly scales and foliage is green in southern California and bluish in the northern part of the state. Jeffrey pine (Pinus jeffreyi) is unique for its enormous cones–up to 10 inches tall–and can grow to 150 feet. The Jeffrey pine, which is a southern California native, has needles in packs of 3, which can be 10 inches long. The cones are long and narrow and they have spikes on the end of each scale, the spikes are turned inward, so the cone is smooth to the touch. This pine tree is fragrant and broken areas of the bark give off a pineapple or vanilla scent. Torrey pines (Pinus torreyana) are prevalent in coastal San Diego and Santa Rosa Island and prefer dry, sandy soil. They do not grow in other parts of the state. Well-known in golf circles, these trees line the Torrey Pines Golf Course in San Diego, which has hosted the U.S. Open. Torrey pines, which are native to southern California, have needles in bundles of 5 and egg-shaped cones that are 5 inches long. This is the only hard pine with a 5-needle bundle. Torrey pines can grow to 40 feet.